Happy Tet, y’all! This week is Tet, the Vietnamese New Year. St. Joseph’s Catholic Church in southwest Charlotte offers a tasty opportunity to explore this ancient tradition transplanted to today’s New South. St. Joseph’s started its annual Tet Festival in 2012. The Vietnamese congregation opened its handsome modernistic new sanctuary off Exit 4 of Interstate 485 in 2004. Today the congregation numbers more than 750 families. The Festival is a happy swirl of activity – games for children and adults, dragon dancers, stage shows by pop singers from Vietnam including young heartthrob Luu Việt Hùng. You can start with a twist on the familiar: maybe a bánh mì meatball sandwich on French bread, or char-grilled beef kabobs, or chilled salad rolls with pork-loaf filling, or deep fried butter quail. Then discover something new. My favorite is bánh khot. Women pour batter into special utensils that look like a cross between a cast-iron skillet and a cupcake tray. With careful, quick attention, the batter turns into chubby little pancakes. 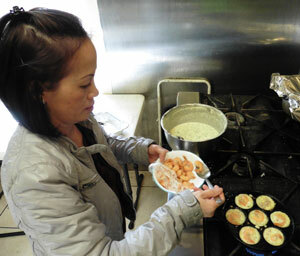 Golden brown, topped with shrimp and morsels of pork, they disappear in your mouth in two bites. Free to attend. Purchase food items individually. Friday February 20, 6 p.m. – 11 p.m.
Saturday February 21, 6 p.m. – 11 p.m.
Sunday February 22, 9:30 a.m. – 2 p.m.